On the fringes of South Africa's Karoo in the malaria free Eastern Cape lies an interesting, attractive and historic little town which invariably charms all who visit it. 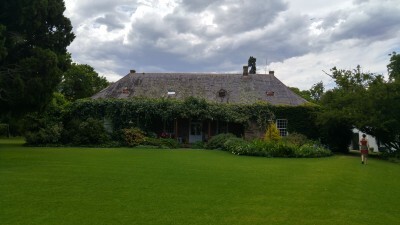 Located at the foot of Boschberg Mountain, a short distance from the N10 main highway between Port Elizabeth and South Africa's interior as well as being on one of the main routes to Graaff-Reinet, Somerset East is both a convenient and a natural place to stop over. Those who do stop here will not be disappointed. Historic and serene the town is picturesque, friendly and, being quiet with little traffic, is easy to walk around. Boschberg, the most prominet feature is a beautiful, wooded mountain and is the furthest north where you will find flora and fauna elements of the Tsitsikamma forest. It is known for its giant indigenous trees like Cape Kastaiing and Yellowwood, beautiful hiking trails, clear water streams, waterfalls and birdlife; even the Knysna and Forest Loerie can be found here. 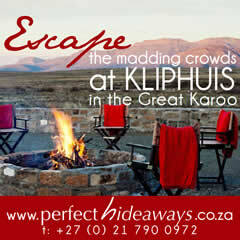 The surrounding area consists of 6 vegetation biomes, varying from wavy grasslands, to Karoo and Noorsveld. In general he countryside around the town is quite varied with impressive mountains, rich farmland, forest and open Karoo veld, all within a short drive of the town. For those who are interested in history, the town owes much of its early years to the British military and settlers as well as the Afrikaners who were farming the area prior to the arrival of the British. This history can be explored both in the town and the surrounding area. (The controversial Slagtersnek rebellion took place in the district). Many of the town's houses and buildings reflect this heritage with lots of houses still standing which date from the early 1800's. A walk down Paulet Street alone is almost like a trip into the past where you will find many historic buildings of which the Somerset East Museum and the Walter Battiss Art Museum are the best known. The latter had been restored recently and has the largest collection of Battiss' work. This pollution and malaria free region is a fly fishing and hunting paradise. There is a beautiful, highly rated 9 hole golf course where the annual Boschberg Classic is held. Other annual events are the Cycling Races (January), Bruintjieshoogte Marathon (March), Biltong Festival (July) and Rose Show (October). Other activities in the area range from the peaceful to the adventurous. 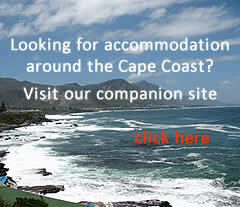 There is a fine variety of accommodation in Somerset East and its surrounds, ranging from the luxurious to budget. Visitors can choose among hotels, guest houses, B&Bs and self catering establishments.